In 1856, quarrymen made an exciting discovery in a cave in the Neander Valley, near Dusseldorf, Germany. They found the remains of humans who were very different from modern humans. Scientists later learned that “Neanderthal” humans inhabited Europe and parts of Asia and North Africa from about 125,000 years ago to about 30,000 years ago. Neanderthals were the closest relatives of currently living humans, sharing more than 99.5% of our DNA sequence. Fossils indicate that Neanderthals looked somewhat like humans, but they had heavy ridges above their eyes. Their skulls were larger than modern humans, indicating that Neanderthals may have had bigger brains. Bones in the throats of Neanderthal fossils lead archaeologists to believe that their verbal communication probably consisted only of grunts. They apparently could not use words they way we do today. Neanderthals apparently lived side-by-side in many places with modern humans, and then they disappear from the fossil record. The mystery of what happened to the Neanderthals still puzzles scientists today, though recent evidence suggests there was some interbreeding between Neanderthals and modern humans. A 2010 study found that people in Asia and Europe get between one and four percent of their genetic material from Neanderthals. We don’t know what happened to the Neanderthals. Some scientists believe they became extinct because the climate changed in Europe and Asia. Others suggest that the modern humans absorbed Neanderthals through interbreeding. Scientists studying Neanderthal DNA are making exciting discoveries, and what we know about Neanderthals may soon change as new evidence is uncovered. 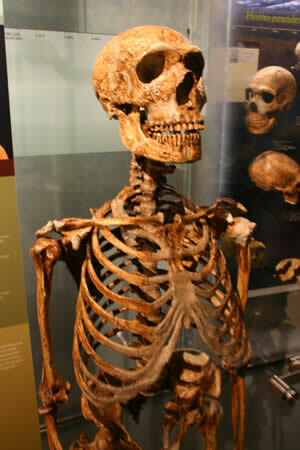 As we travel back in time, our ancestors looked less and less like us. 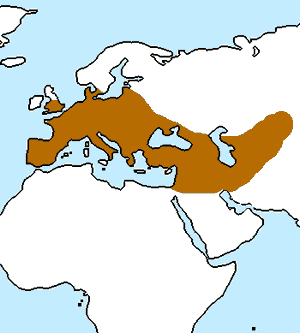 Neanderthal settlements have been identified throughout Europe south of Scandinavia, Great Britain, and Western Asia.